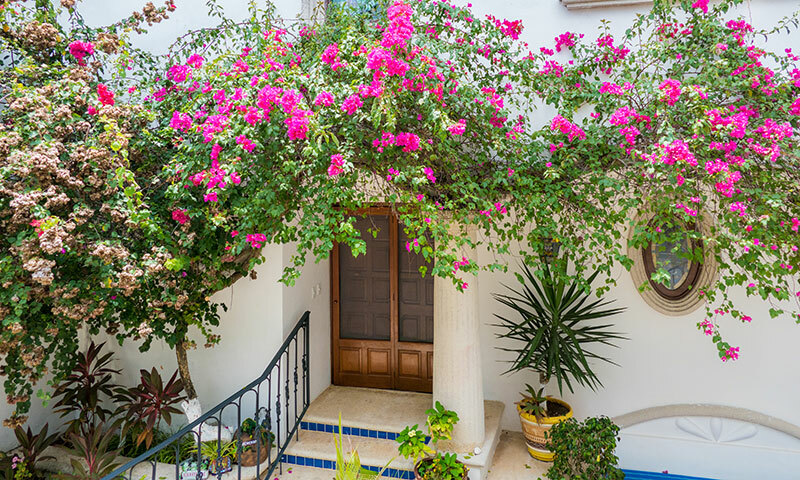 Upon entering the villa, the first area is a gorgeous foyer with a grand interior staircase that goes from the ground floor all the way to the rooftop. 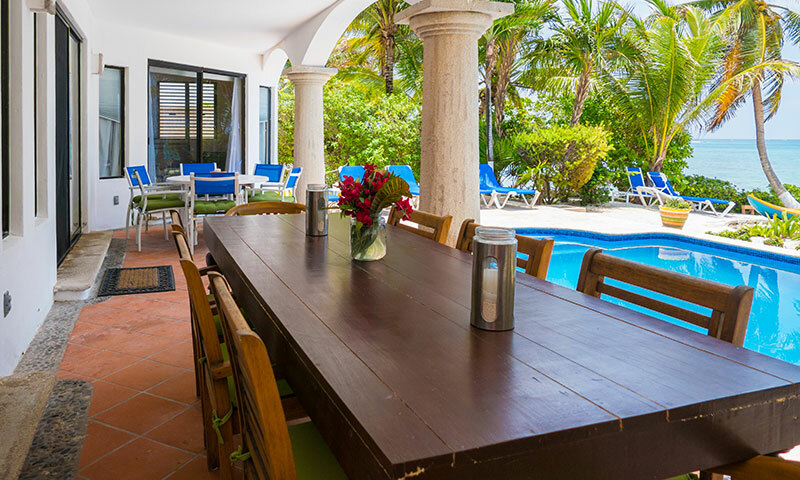 There you will find a huge tiled deck with wet bar for sunbathing, entertaining, sunset cocktails and stargazing. 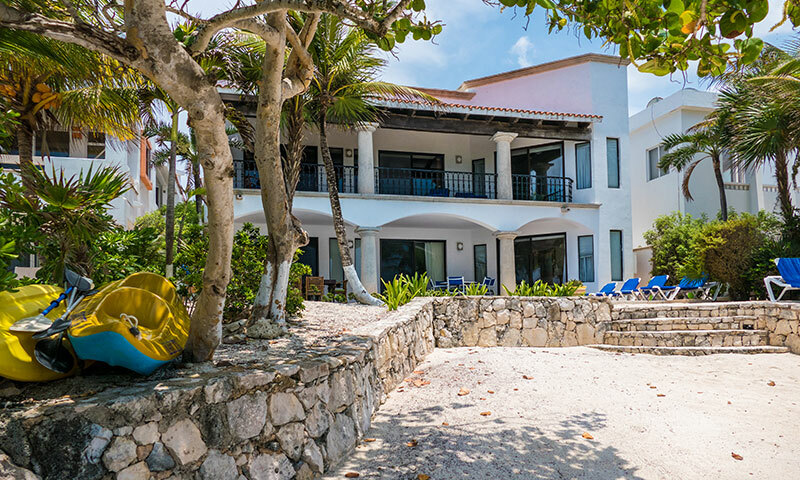 5,000 square feet of luxurious living space offers 4 bedrooms with identical floor plans on two levels; 2 bedrooms, 2 baths, full kitchen and living area. 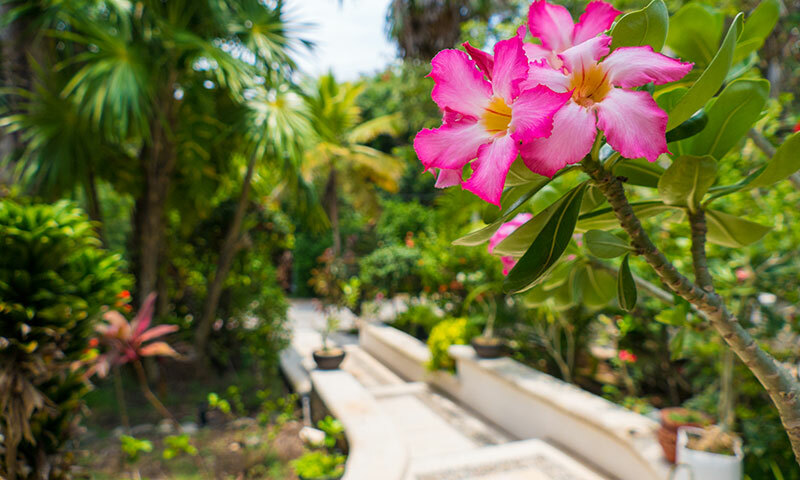 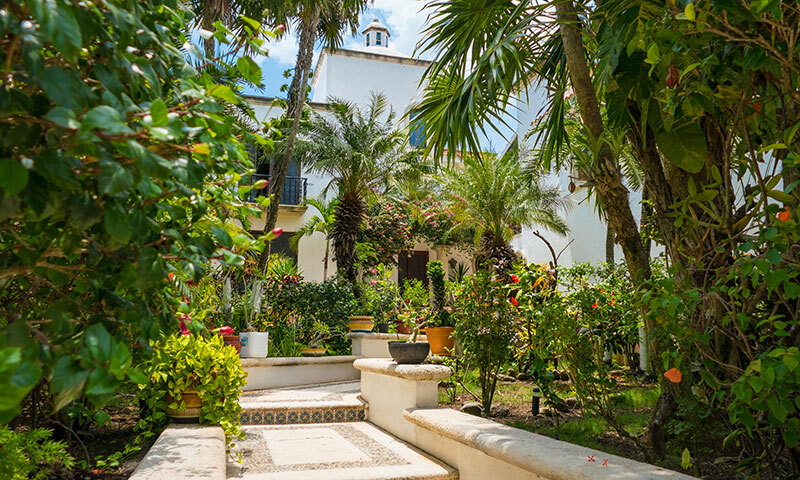 Walk through a beautiful garden where you will also find the 1-bedroom guesthouse. 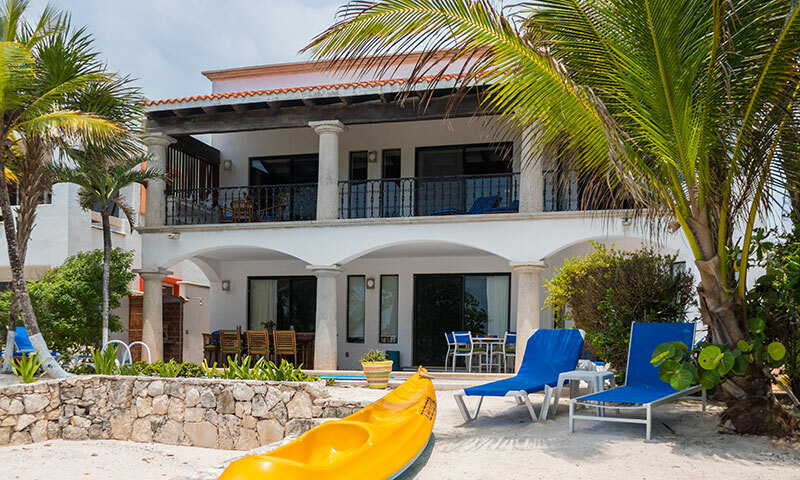 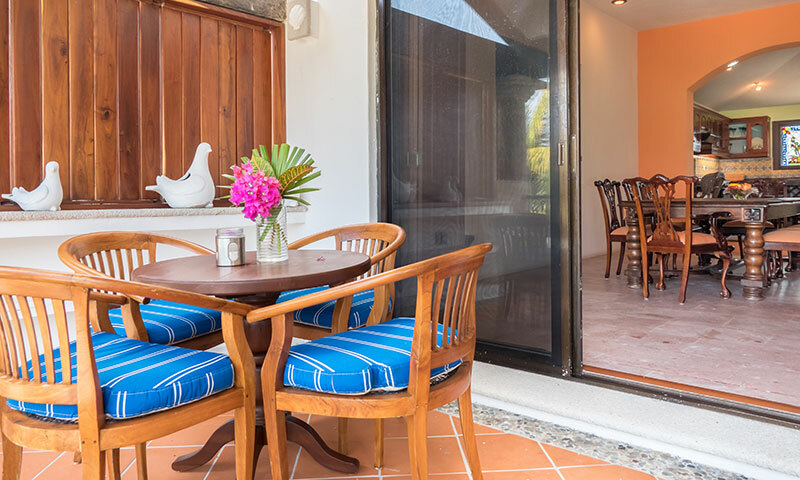 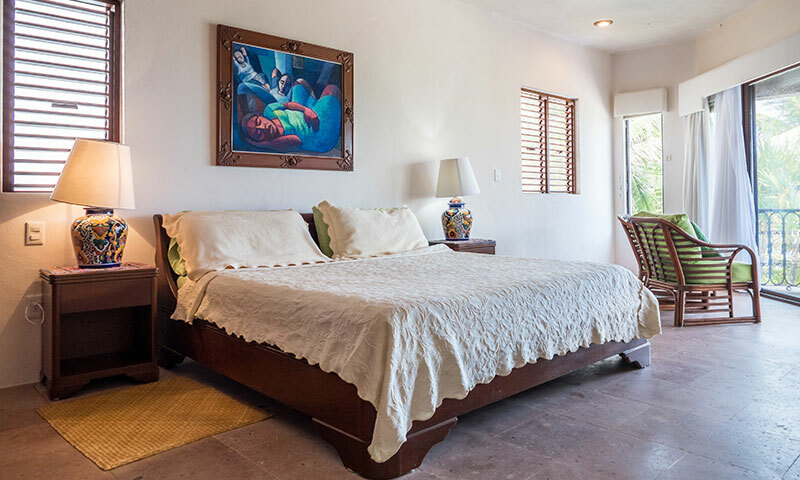 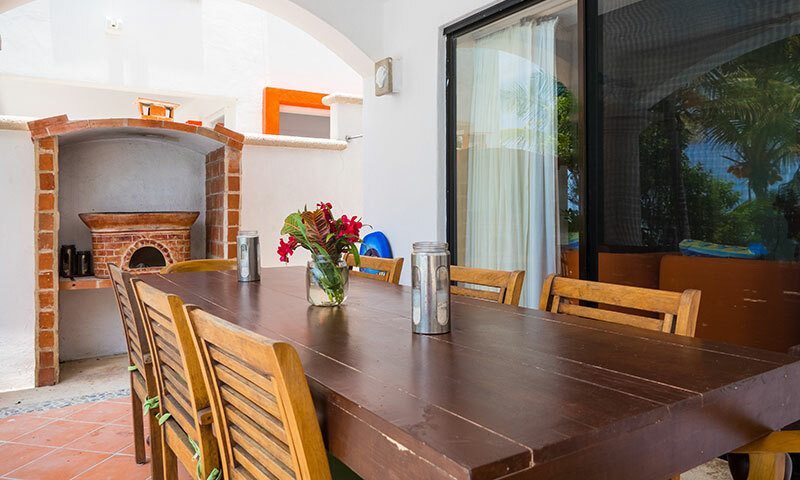 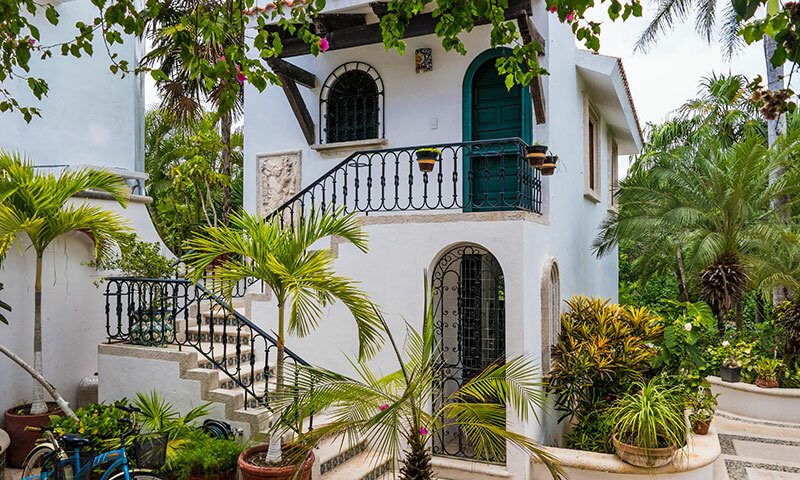 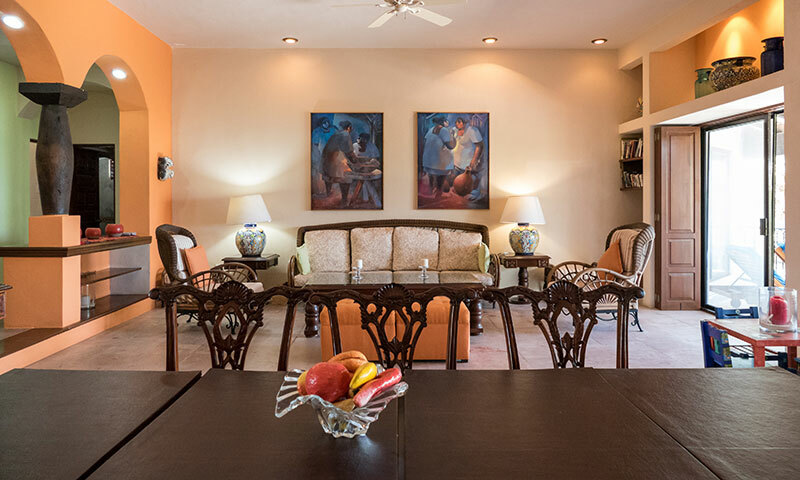 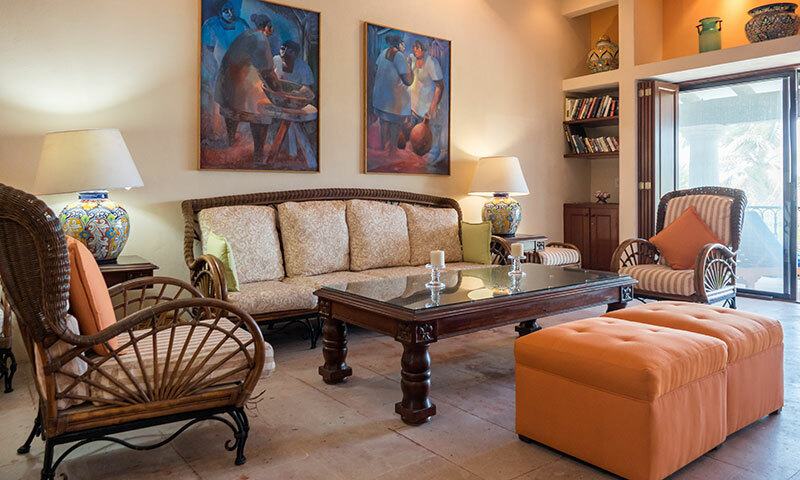 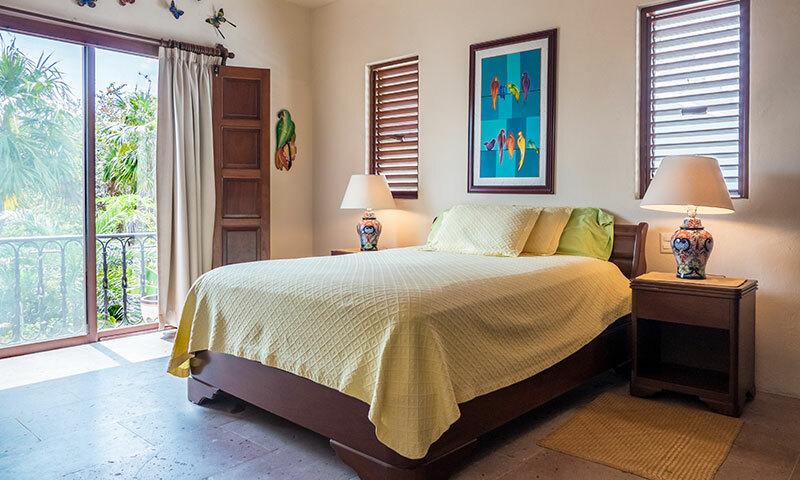 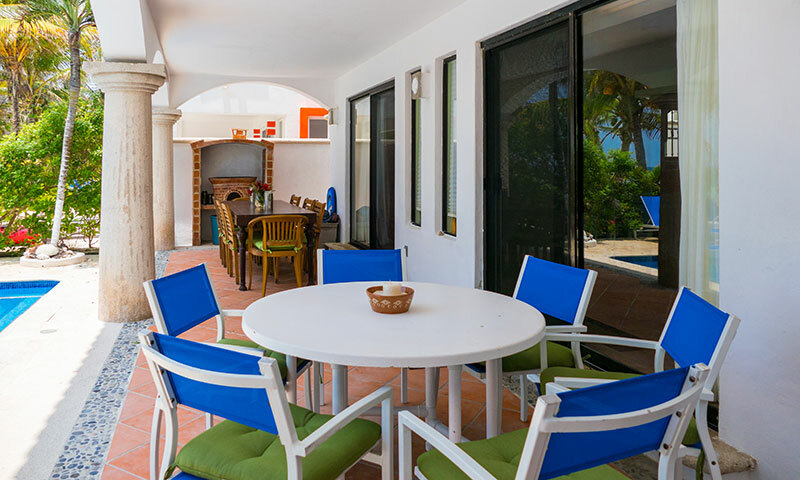 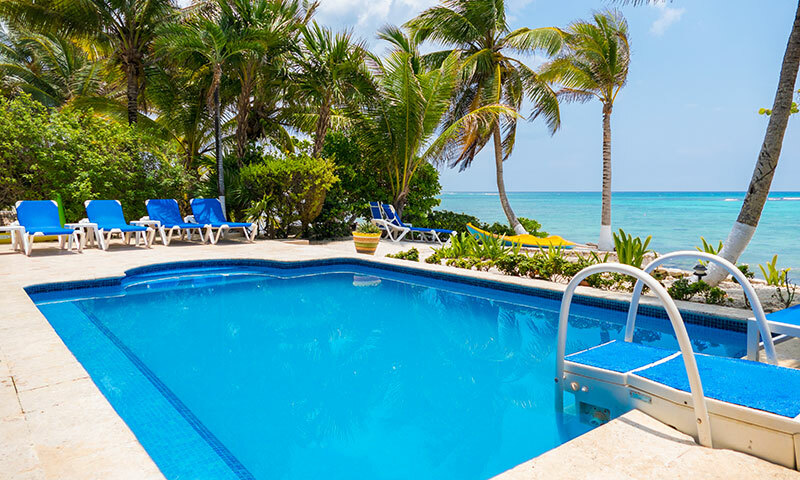 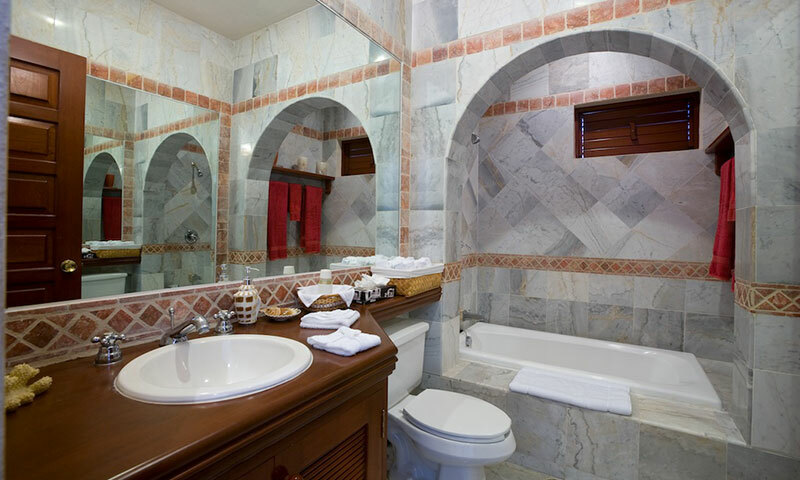 Each floor has a spacious master bedroom and a large guestroom, both with en-suite baths, living room, dining room, and gourmet kitchen and either a balcony or terrace overlooking the Caribbean. 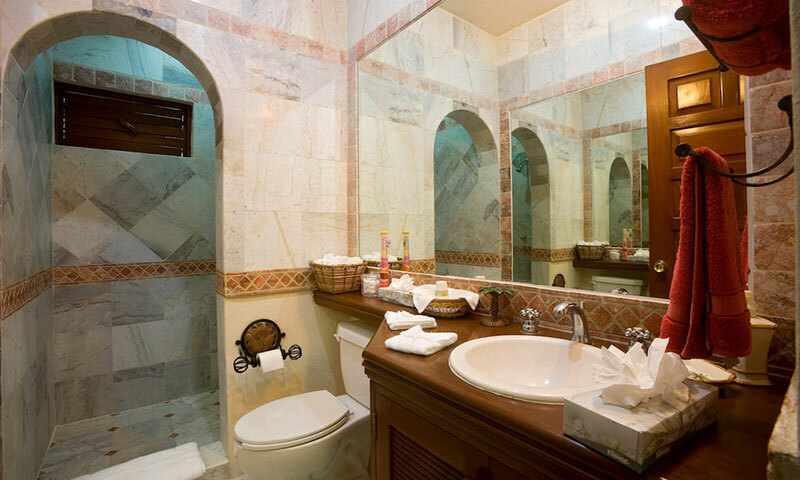 The owners had the villa specially designed to flow as one villa, or you can close the doors and have privacy on each floor. 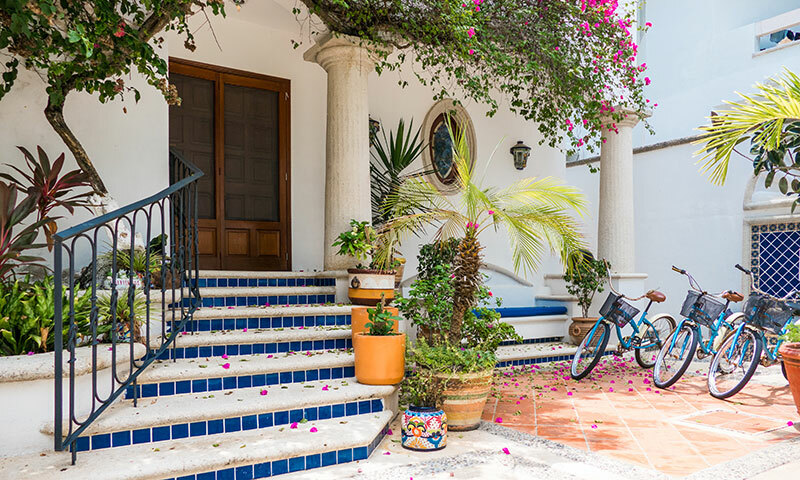 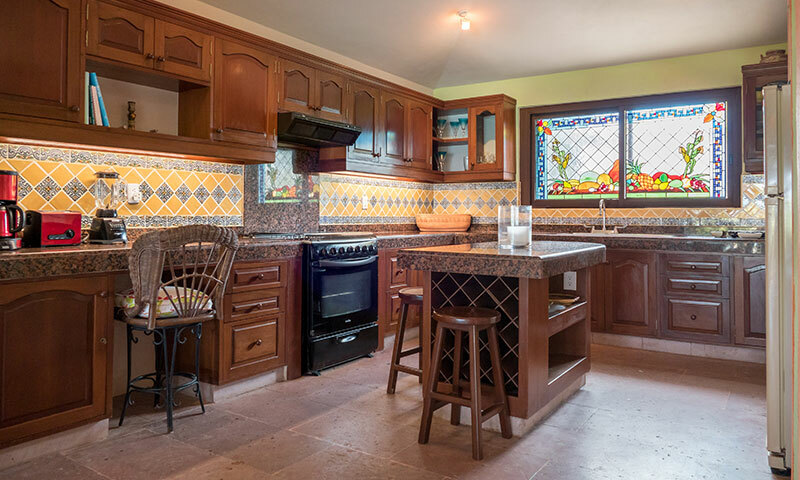 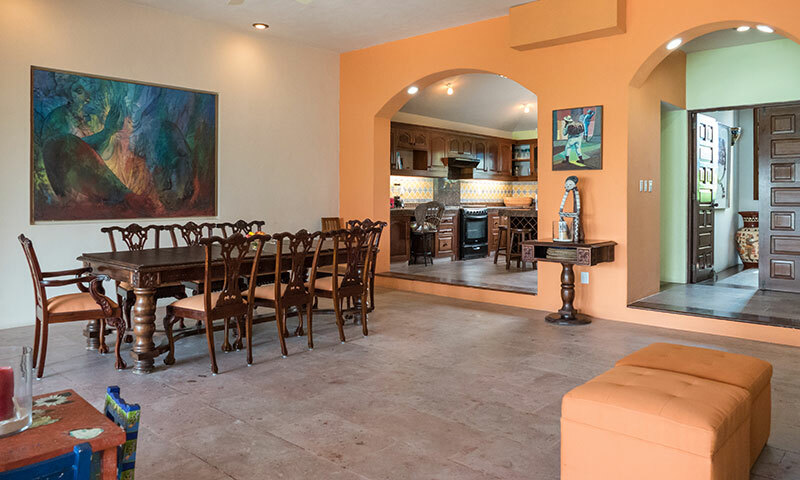 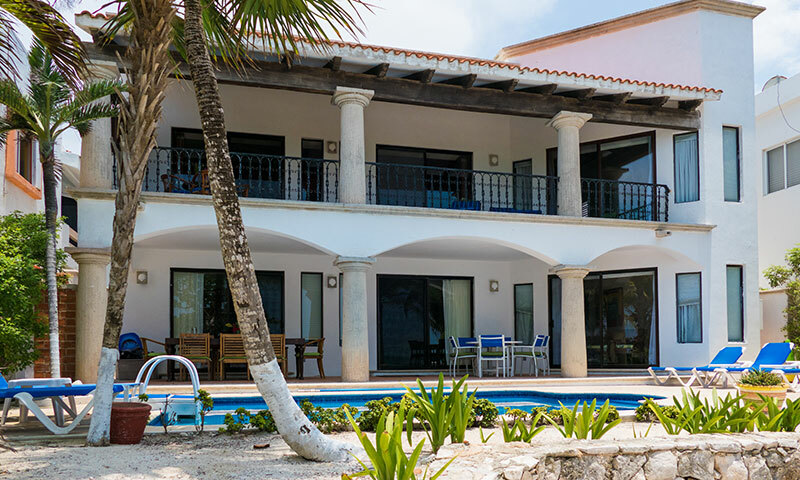 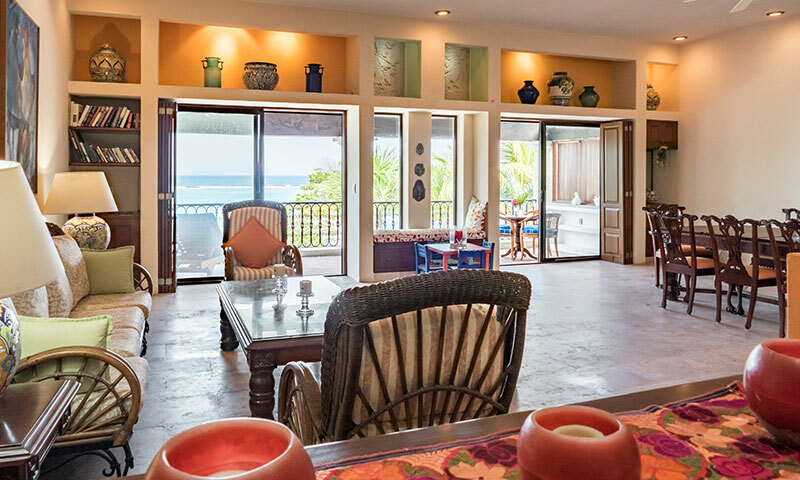 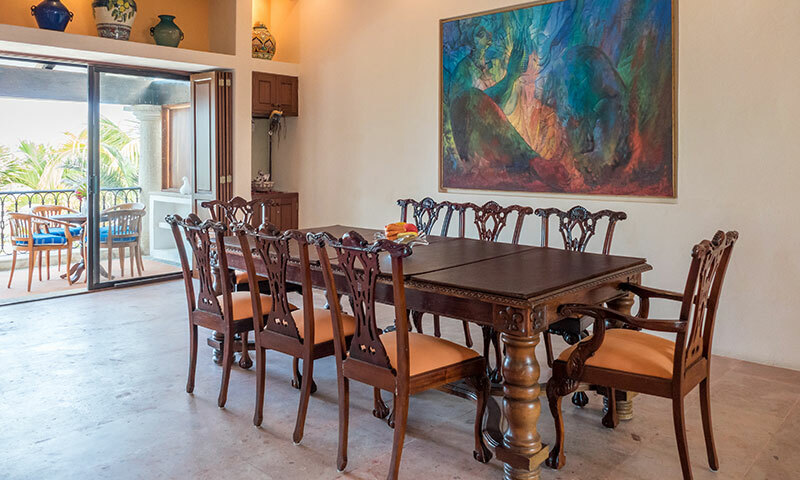 They have also taken great lengths to give the house an air of luxury by installing granite/marble countertops, Talavera tile and Canterra stone floors, custom made furniture and colorful painted walls. 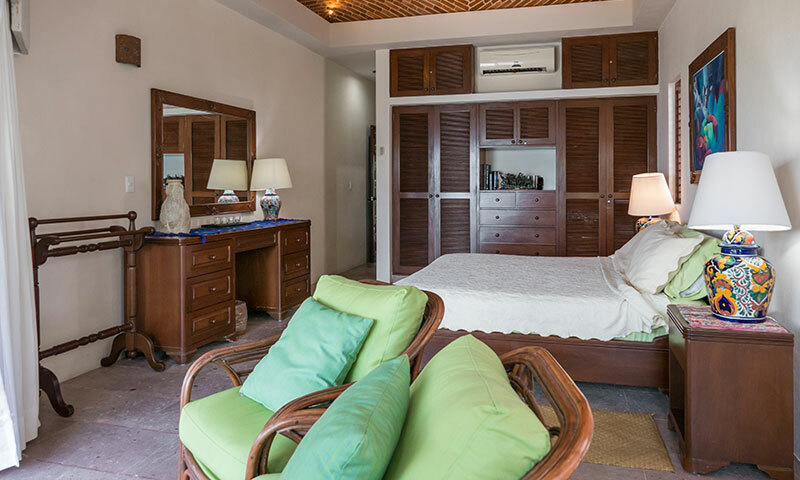 The fifth bedroom is located in the guest house. 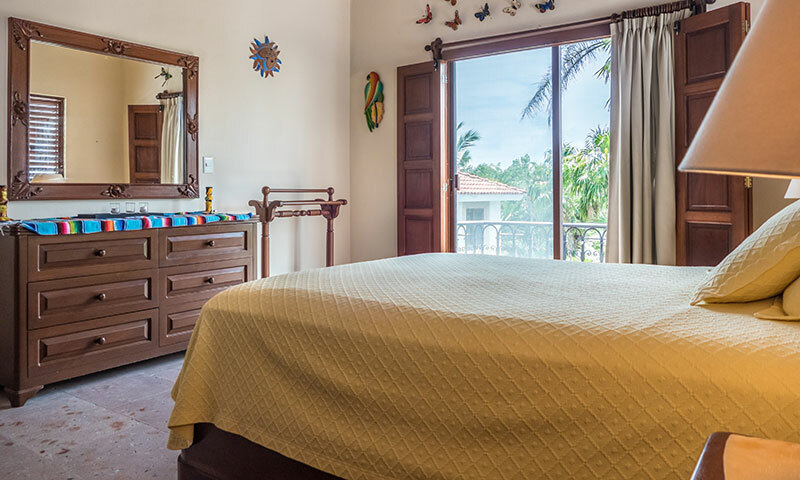 It has a double bed, bathroom and garden views. 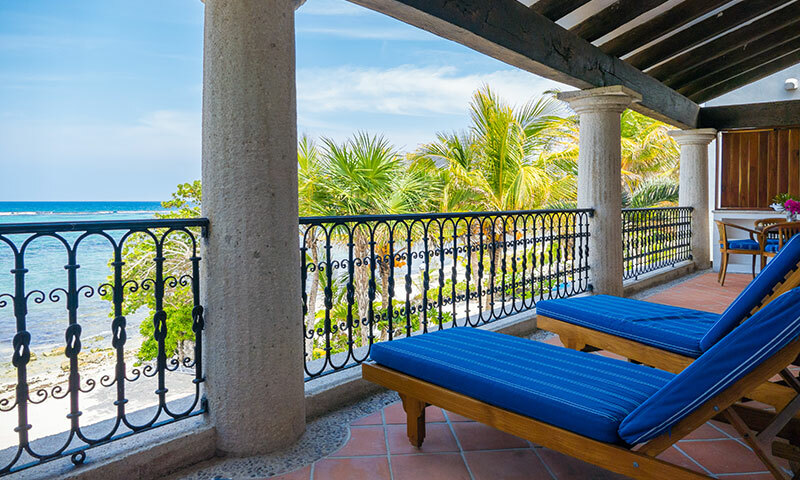 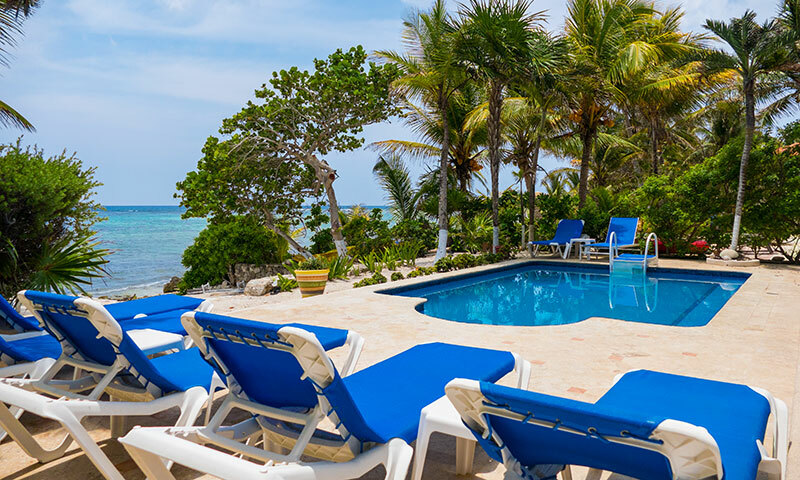 Outside is the beachfront pool, chaise loungers with both shade/sun areas. 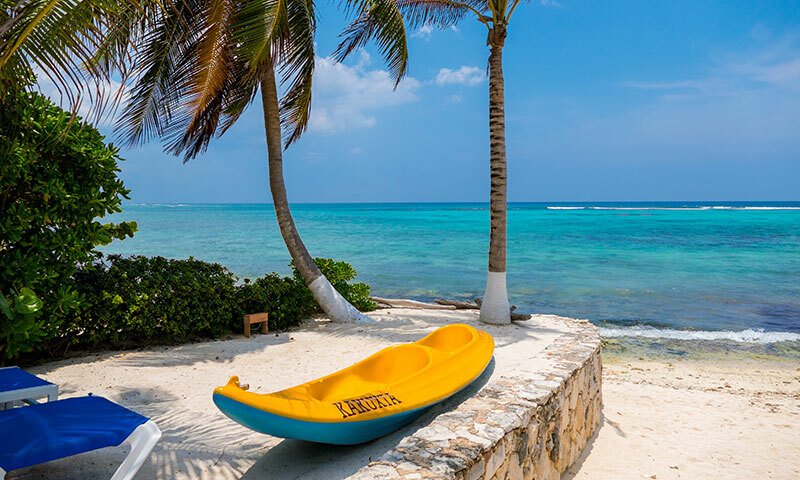 There are kayaks available for guest use as well as three bicycles. 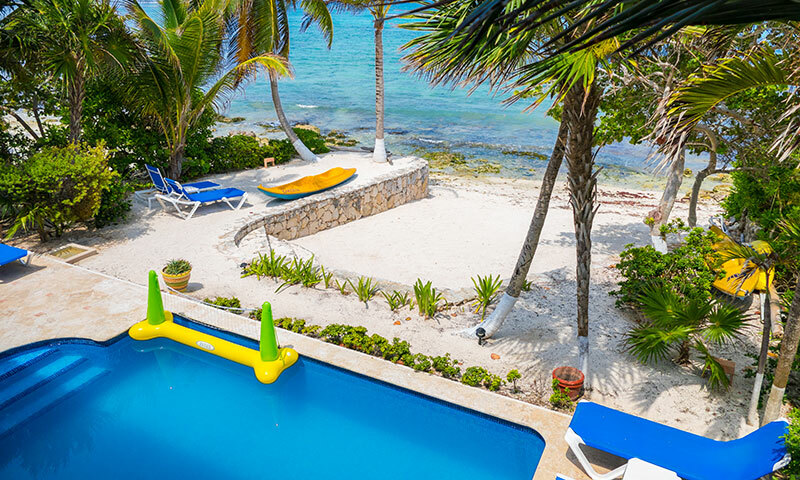 The beach in South Akumal is very quiet as there are only twenty homes on the bay. 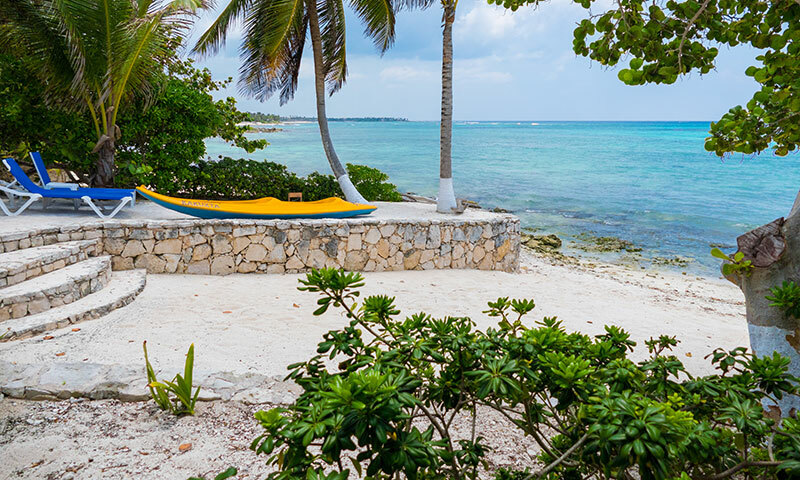 There are many activities to see and do in the area or just chill out and relax. 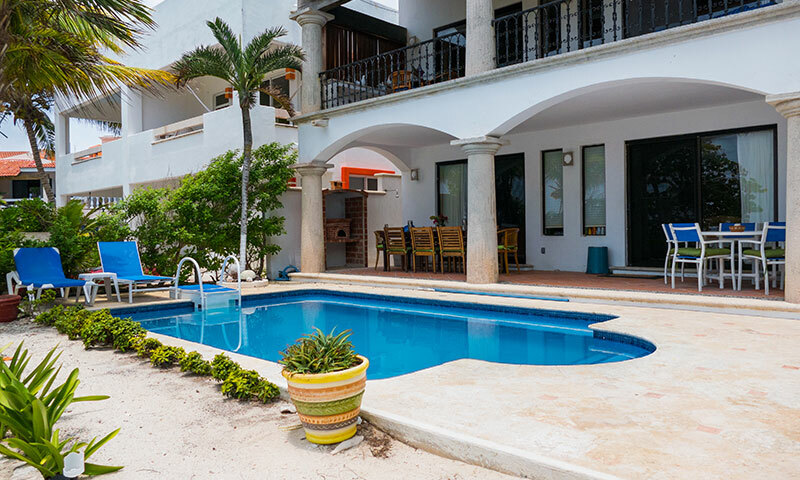 The town of Akumal is a short drive up the road and has a number of restaurants and shops to choose from. 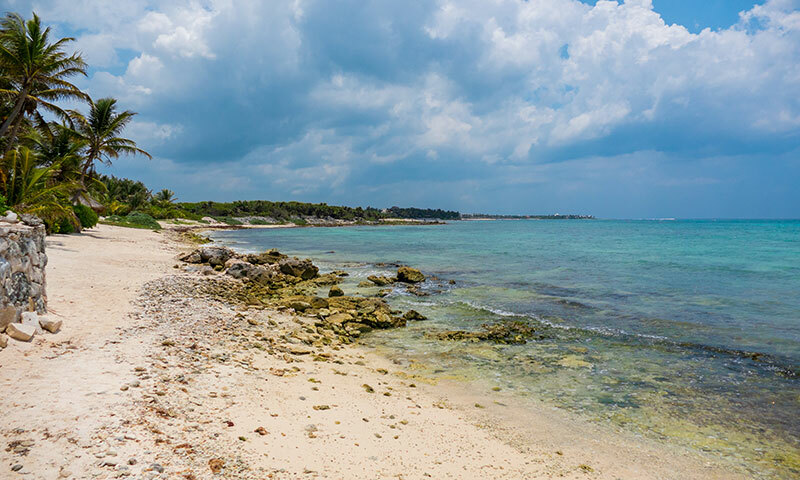 There are many golf courses and other beaches to visit as well. 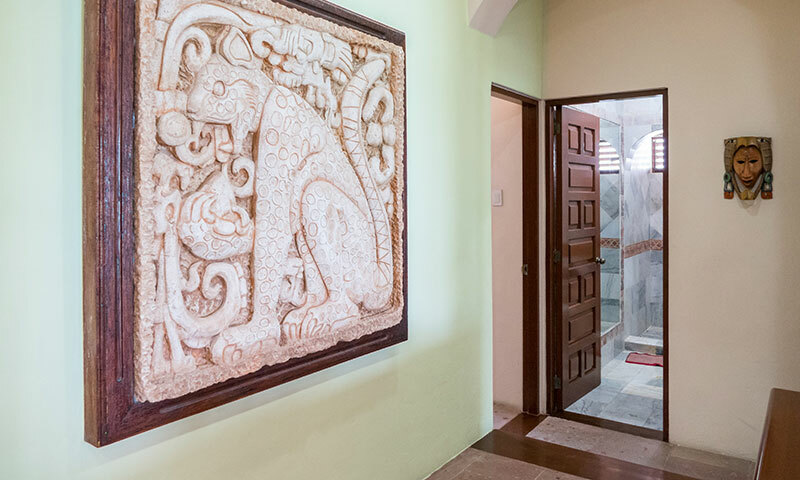 You can visit Mayan ruins, take a boat over to Cozumel for the day, shop on 5th Avenue in Playa del Carmen, spend the day at our famous Xcaret eco park, snorkel in Yal-ku lagoon or at Xel-ha, visit the beautiful dry caves of Aktun Chen, snorkel or scuba dive in freshwater cenotes. 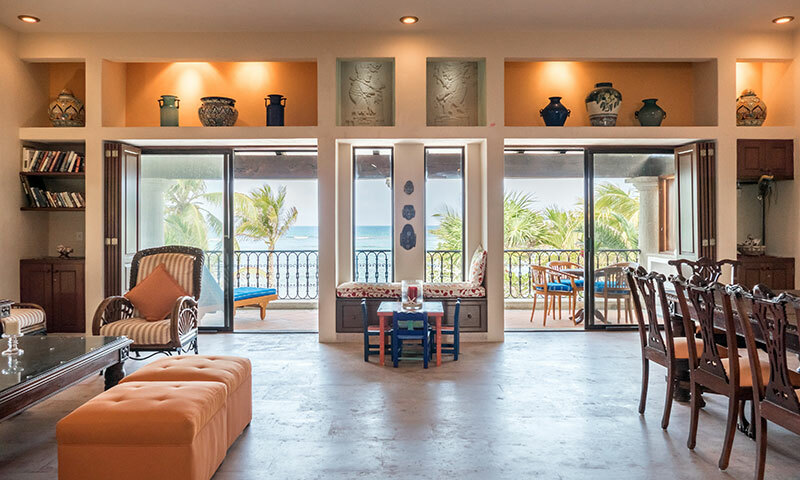 Ka Kuxta fills up quickly in high season, so please contact us for reservations.